While the U.S Legislature continues to debate the immediate future of NASA and the possibility of flying the already planned contingency Launch On Need (LON) STS-335 mission as a full up mission to the ISS in its own right (STS-135), NASA has updated its ground processing master document for STS-335 as well as the overall parameters pertaining to all three orbiter’s Orbiter Modification Down Period (OMDP) time interval requirement. 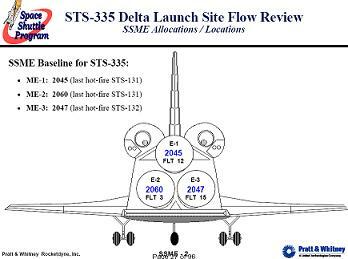 An updated version of the Launch Site Flow Review – known as the Delta Launch Site Flow Review (DLSFR) held on July 22, 2010 – shows that Atlantis’ three Space Shuttle Main Engines (SSMEs) have been baselined for the flight. Baring any last-minute changes, Atlantis is now expected to use SSME 2045 in the Engine 1 position, SSME 2060 in the engine 2 position, and SSME 2047 in the engine 3 position. Engine 2045 last flew on STS-131 with Discovery in April 2010; engine 2060 on STS-131; engine 2047on STS-132 last May with Atlantis. In terms of a cryo prop load, all five (5) of Atlantis’ cryo tank sets will be filled completely, all 5 GN2 (Gaseous Nitrogen) tanks will be completely filled, the Forward RCS (Reaction Control System) will be filled to “midpoint,” and the aft RCS and OMS tanks will be fully loaded. Overall, Atlantis is expected to have ~95 hours of pad hold time, with the Hydrogen commodity being the limiting factor. Also, an update to the Ascent Performance Margin (AMP) now shows Atlantis carrying +5,502 lbs of AMP. As was shown in the LSFR, all weight and CG characteristics are within limits and 102 lbs of aft ballast (i.e. empty aft ballast boxes) will be carried. For an RTLS (Return to Launch Site) abort, a 185 sec and 25 sec Aft RCS and Forward RCS respective prop dump would be required. Likewise, for a TAL (Trans-oceanic Abort Landing) abort, a 120 sec and 65 sec Aft RCS and Forward RCS respective prop dump would be needed. Furthermore, in addition to the standard turnaround processing for Orbiter Atlantis, one modification for OV-104 has been approved since the LSFR earlier this year. That modification relates to the Ceramic Plug/Insert Redesign. “Redesigns ceramic plug sleeving/retainer for all 0.75” diameter plugs & 0.875” shorter diameter plugs (0.75” length and less) to increase cord thickness to meet the installation torque requirements – preventing plug from potentially backing out due to vibration loads during ascent,” notes the Delta LSFR. This modification was approved June 4, 2010 at a Delta PRCB (Program Requirements Control Board) as part of a sweeping, fleet-wide alteration. Aside from this modification, there is only one more potential modification for Atlantis this flow. This potential mod calls for the installation of TriDAR to Atlantis’ external Airlock truss in the Trajectory Control Sensor 1 (TCS 1) position. Since the TCS 1 is no longer flown, the location is already free for TriDAR installation. Currently, only Discovery has TriDAR DTO (Detailed Test Objective) capability, having performed the TriDAR DTO on STS-128 and STS-131. TriDAR, which his designed to demonstrate technology for autonomous rendezvous and docking in Low Earth Orbit, would be installed by Boeing tech orders. 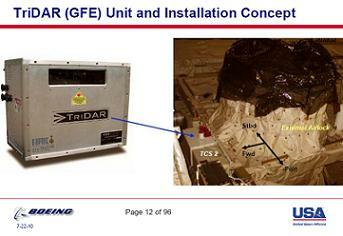 A Change Request to protect for the possibility of flying TriDAR on STS-335 was approved on July 13, 2010. However, one of the more interesting considerations for this particular OPF (Orbiter Processing Facility) flow for Atlantis are the numerous OMRS Limited Life/Time/Cycle & Interval Requirements that will come due before or shortly after Atlantis’ targeted launch on STS-335. “Based upon a request at the STS-335 LSFR, a review of the OV-104 OMRS Limited Life/Time/Cycle & Interval Requirements thru January 21, 2012 was performed,” notes the Delta LSFR. While a majority of items requiring work or inspection could either be accomplished within the extended flow for Atlantis (a flow of nearly 9½ months) or a waiver passed to defer work on a particular system/subsystem until after STS-335. These three items include Removal and Replacement (R&R) of the Lower and Upper Hydrogen/Water Separator (due 6/24/2011), R&R of all three (3) APUs (due 9/7/2011), and retest of Forward RCS Pod Thrusters if 18-months have elapsed since previous flight (due 11/14/2011). 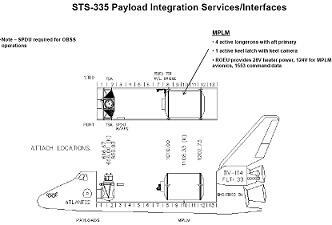 Given the STS-335 launch and mission schedule, this particular requirement is not in danger of lapsing prior to or during STS-335 and the mission would be completed long before the 6/24/2011 due date. However, 6/24/2011 is the working target launch date of the potential STS-135 mission – should Congress approve funding for the flight. In addition to these three items, there are seven more OMRS exception/waivers pending for Atlantis toward her use on STS-335. 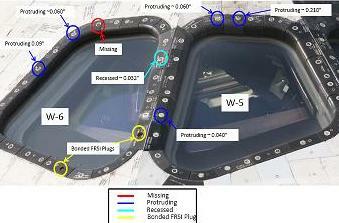 These include a Radiator Hinge Inspection that is due this flow (after flight 33) but has concurrence to extend the requirement until after flight 34, Wing Leading Edge Spar Structural Inspections (which are in work and will be competed less four panels prior to STS-335), Left RCS OXID GHe system A-leg secondary regulator lock-up high, and PRSD (Power Reactant Storage Distribution) O2 tank post-flight vac ion pump operation. Also awaiting waivers or exceptions are Right POD He iso valve intake leak checks, O2 system 1 Relief Valve failed reseat leakage test, and drag chute deploy system 2 light failure resolution. In addition to the above considerations is the fact that under the previous OMDP interval agreement in 2007 (5.5 years or 8 flights… whichever came first), Atlantis will come due for OMDP on January 21, 2011 based on the 5.5 year interval rule. 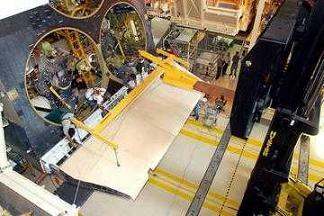 This meant that Atlantis was due for OMDP four months prior to her planned use on STS-335. Likewise, Orbiter Discovery (OV-103) came due for OMDP after STS-131 based on the 8 flight rule – a rule that would have precluded her use on STS-133 (set for launch on November 1, 2010) without passage of engineering waivers and deferrals. In fact, it was the use of Discovery on STS-133 (her 9th flight since her last OMDP) that prompted a new review of ODMP time interval requirements – much the same way Discovery’s and Atlantis’ use through the end of the Space Shuttle Program manifest kick-started the previous review and extension of OMDP time interval requirements in 2006/2007. Under the pre-2007 OMDP time requirements (3 years or 8 flights, whichever came first) Discovery would have come due for OMDP in March 2008, Atlantis in July 2008, and Endeavour in July 2010. Given the extensive amount of time needed to complete an OMDP (on the order of one calendar year) and investigation was conducted into the possibility of extending the OMDP time interval based on sound engineering data gained during the orbiter’s previous OMDPs. 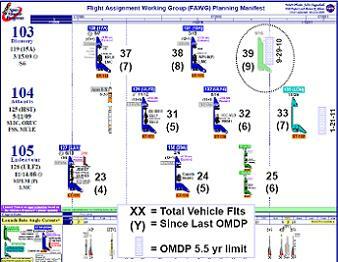 As a result, the OMDP time interval was extended from 3 years/8 flights to 5.5 years/8 flights, whichever came first. This allowed Discovery to fly through September 2010 (per the 5.5 year limit), Atlantis to January 2011, and Endeavour to January 2013. However, after this OMDP extension was passed, the Shuttle manifest grew to include one additional mission – STS-134. A subsequent flight order swap between STS-133 and STS-134 placed 134 ahead of 133 in the flight order and handed 134 to Endeavour and 133 to Discovery – her 9th post-OMDP flight and a violation of then-current OMDP time interval rules. Thus, “The addition of STS-133 to the SSP manifest (launch date Sept. 2010) will result in a 9th flight on OV-103 since its last OMDP,” notes the OMDP extension study presentation dated February 4, 2010. Subsequent flight delays to STS-134 pushed the STS-335 Crew Rescue flight by Orbiter Atlantis to April 2011 – four months beyond her OMDP due date of January 2011. As such, a study into the further extension of OMDP time intervals was carried out – specifically in terms of OV-103 (STS-133) and OV-104 (STS-335). In all, the study was quite extensive – as all NASA engineering studies are – and a new recommendation was brought forth to the PRCB to extend the OMDP time interval from 5.5 years/8 flights to 6.5 years/9 flights. Under the new rules, Discovery would be cleared (from an OMDP standpoint) to fly the STS-133 mission (as long as that mission occurs before September 29, 2011 – the new time limit for her OMDP requirement). Likewise, Atlantis would now be clear from an OMDP standpoint to fly through January 2012. Endeavour gains no mention in the extension presentation due to the fact that she was clear from the previous 5.5 year/8 flight OMDP time/flight requirement to fly through January 2013 — two years beyond the current end of the Shuttle Program. However, the review and recommendation to the PRCB was not as cut and dry as simply extending the time and flight intervals between overhauls. An extensive investigation into all the OMDP activities and Orbiter systems had to be conducted to ensure that Discovery’s STS-133 mission and Atlantis’ STS-335 flight could be carried out safely from an Orbiter systems standpoint. “In July 2009, a two-phased approach for reviewing all OMDP-coded requirements was approved by OPO (Orbiter Project Office) to allow for early identification and completion of non-extendable requirements over the last 2 flows,” notes the PRCB OMDP presentation. In all, this quick look covered 769 requirements, 725 of which were coded ‘green’ (“no need to perform requirement”) for the 6.5 year/9 flight extension, 24 coded as ‘yellow’ (“more time or data needed to definitively assess”), and 20 coded as ‘red’ (“needs to be satisfied prior to 9th flight [on OV-103]”). The Phase I assessments were presented to the OPO in August/September 2009, at which time Ground Ops agreed to perform all 20 ‘red’ requirements on Discovery during her flow toward STS-131 in April 2010. Extension criteria included: likelihood of failure, consequence of failure, redundancy (like/unlike), operational workarounds, failure history/trending, and confidence gained from preflight or in-flight checkouts. Each requirement was then presented by a system representative to the ERB with full PRT support via telecon. Rationale for OMRS V31 general zonal inspections (aka: “requirements not assigned to a specific subsystem”) was developed separately and was based on historical results. OMRS V31 zonal inspections include fluid, mechanical, electrical, and structural components. As a result of these ERB reviews, one Phase I ‘green’ requirement and one Phase I ‘yellow’ requirement were changed to ‘red’ and were subsequently scheduled for completion by Ground Ops. Those two requirements were the Radiator-to-PLB fitting gap measurements and the PPO2 controller/valve functional checkouts. All remaining ‘yellow’ requirements were reassessed to ‘green’ during the ERB meetings. This requirement pertained to the ECLSS waste tank removal for Nitric acid flush. Review of this requirement resulted in an approval to defer this task until after flight 9 of Discovery. In the end, all 769 OMDP requirements were either dispositioned ‘green’ or ‘red.’ For Discovery and Atlantis combined, 746 requirements were dispositioned ‘green’ and 21 dispositioned ‘red.’ All ‘red’ requirements were scheduled for completion over the final two OPF flows for each vehicle – 128-to-131 and 131-to-133 for Discovery and 129-to-132 and 132-to-335 for Atlantis. Furthermore, 2 OMPD requirements were found to be non-deferrable – one each for Atlantis and Discovery: external airlock O2 ISO Valve Leak Check for Atlantis and HYD Series Retract Valves R&R for soft goods replacement for Discovery. On February 11, 2010, the PRCB reviewed the OMDP interval extension proposal and officially approved the increase to 6.5 years/9 flights.